Asphalt pavement mixture producers continue to apply technologies to make asphalt pavements more energy-efficient to produce and more resource responsible, according to a recent survey of asphalt mix producers conducted by the National Asphalt Pavement Association (NAPA), Lanham, Maryland. The survey of the U.S. asphalt pavement mixture production industry has been conducted for each construction season since 2009 by NAPA in partnership with the Federal Highway Administration (FHWA), Washington. Over the years, the survey has documented increases in the use of recycled materials and warm-mix asphalt. Nearly 39 percent of asphalt pavement mixture produced in 2017 was produced as warm-mix asphalt at reduced temperatures, which decreases energy demands, reduces air emissions, and improves compaction at cooler temperatures. More than 99 percent of the asphalt pavement material removed from roads and parking lots in 2017 was put back to productive use, primarily in new asphalt pavement mixtures. Asphalt mix producers continue to make significant use of energy-saving warm-mix asphalt technologies. In 2017, 147.4 million tons of warm-mix asphalt was produced at reduced temperatures—nearly 39 percent of total asphalt pavement mix production, and a 777 percent increase since 2009. Nearly 79 million tons of recycled materials—primarily reclaimed asphalt pavement material (RAP) and recycled asphalt roofing shingles (RAS)—were used in new asphalt pavement mixtures during the 2017 construction season, which was similar to the amount of these materials used in 2016. 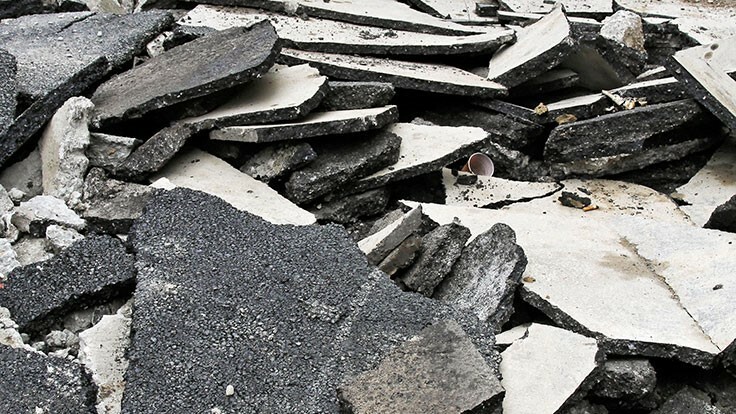 Ground tire rubber, steel and blast furnace slag, and recycled cellulose fibers were among the other recycled materials used in new asphalt pavements in 2017. The use of RAP and RAS alone resulted in cost savings of more than $2.2 billion compared to the use of virgin materials. More than 76.2 million tons of RAP and nearly 950,000 tons of RAS were used in new asphalt pavement mixes in the United States during 2017. An additional 3.9 million tons of RAP and RAS were used as aggregate in cold-mix asphalt and other road-building activities. At year-end 2017, about 103.5 million tons of RAP and RAS was stockpiled for future use across the country. Reclaiming RAP for use in future pavements saved nearly 50 million cubic yards of landfill space during 2017. The survey was conducted in the first quarter of 2018. Results from 238 companies with 1,158 plants in all 50 U.S. states, the District of Columbia and American Samoa, along with data from state asphalt pavement associations for 32 states, were used to compile the report.